Payment by PayPal or Credit Card via the website is due at time of purchase. We do not accept any other forms of payment or payments over the phone. Business Hours are Monday thru Friday 9am-5pm ET. New Years Day, MLK Jr's Birthday, Washington's Birthday, Memorial Day, Independence Day, Labor Day, Columbus Day, Veteran's Day, Thanksgiving & Christmas. WE ARE CURRENTLY ACCEPTING RUSH ORDERS ON AN AS AVAILABLE BASIS. Rush orders are compelted after hours, so that other orders are shipped on time. There is a fee based on the quantity and timeframe needed. Please inquire about rush orders prior to placing an order online. 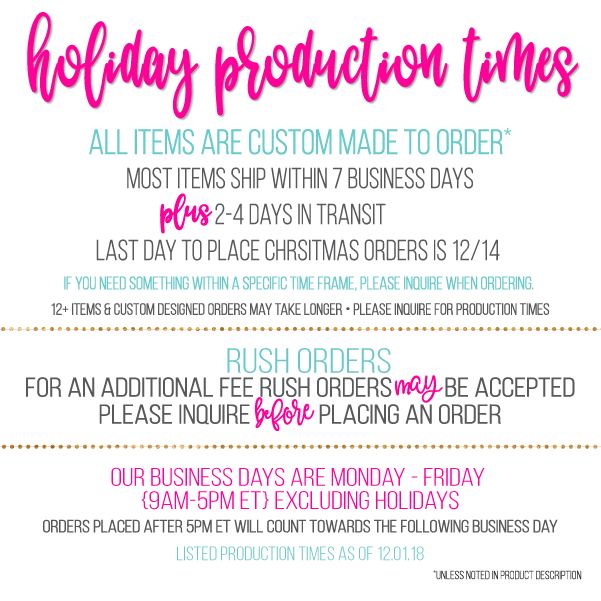 If you have any questions or would like to place a custom order, please email contact me via "CONTACT US" link at the top and bottom of the page. Most orders are shipped via Priority Mail 2-3 business day service. At our disrection, orders over 9 tumblers may be ship via UPS or Fed-ex Ground and can take up to 5 business days within the U.S. depending on location. First CLass Mail option is available for 1 tumbler and smaller items. Please note that there is NO insurance available on First Class Mail shipments. Shipping times also vary and there are no guarantees for this option. All Packages, unelss stated, are insured. Please inspect your order and report any damages within 2 business days of receipt. Due to the breakable nature of our products, if damages are not reported within this time frame, your items will not be replaced or reimbursed. At times, the USPS does require you to take the damaged items to your local post office for inspection, failing to do so will automatically deny the claim. Shipping insurance does not cover theft once marked delivered or int'l shipping charges to deliver replacement merchandise. PLEASE MAKE SURE YOUR SHIPPING AND EMAIL ADDRESSES ARE CORRECT. INCORRECT ADDRESSES AND CHANGES MAY RESULT IN DELAYS. WE ARE NOT RESPONSIBLE FOR LOST PACKAGES DUE TO INCORRECT SHIPPING ADDRESSES. IF AN ORDER IS SHIPPED AND RETURNED DUE TO AN INCORRECT SHIPPING ADDRESS, YOU WILL BE RESPONSIBLE FOR CHARGES TO RESHIP THE PACKAGE(S), THERE WILL BE NO REFUNDS. An order shipping notification email with tracking information will be sent to you once your item(s) have shipped. We will ship to other countries upon request. International customers are responsible for any customs fees upon delivery. Int'l First Class Mail in transit times vary by location. Int'l Priority Mail is 6-10 business days in transit. PLEASE DO NOT RESPOND TO AN EMAIL FROM PAYPAL, IT WILL NOT GET ANSWERED. PLEASE READ CAREFULLY PRIOR TO PURCHASE. All Items in our store are custom made for you, unless specified. Any cancellations or changes to an order must be made within 24 hours of placing the order. Please make sure to read production and shipping times before ordering. WE DO NOT ACCEPT ANY RETURNS UNLESS THERE IS A MISTAKE ON OUR PART AS ALL ORDERS ARE CUSTOM AND HANDMADE. IF THERE IS A MISTAKE MADE IN THE PERSONALIZATION OF YOUR ITEM(S) WE WILL BE HAPPY TO REPLACE THE ITEM(S) OR ISSUE A STORE CREDIT IN THE AMOUNT OF THE ITEM(S). IF YOUR ITEM(S) ARE DAMAGED OR THERE IS A MISTAKE IN THE PERSONALIZATION, PLEASE NOTIFY US WITHIN 2 BUSINESS DAYS AND WE WILL BE HAPPY TO RESOLVE ANY ISSUES. AFTER 2 BUSINESS DAYS NO REFUNDS, EXCHANGES OR CREDITS WILL BE ISSUED. PLEASE SUBMIT A CLAIM, INCLUDING PHOTOS OF THE DAMAGED PRODUCT VIA THE CONTACT TAB. ANY ITEMS REPLACED DUE TO SHIPPING DAMAGES ARE SUBJECT TO SHIPPING FEES AS THE USPS, UPS, FEDEX, ETC. DOES NOT COVER SHIPPING COSTS FOR REPLACEMENTS. At times, the USPS does require you to take the damaged items to your local post office for inspection, failing to do so will automatically deny the claim. PLEASE MAKE SURE THERE IS A SAFE PLACE FOR ITEMS TO BE DELIVERED, AS SHIPPING INSURANCE DOES NOT COVER THEFT ONCE THE ITEM IS MARKED DELIVERED BY THE CARRIER. Your privacy is very important to us. We do not sell or share personal information with anyone. Name, Shipping/Billing Address, Email address, Phone number, Credit/Debit Card Information. This information is only used to secure payment for merchandise. We are committed to the security of any private information. Credit/Debit Card Information is encrypted by our payment processor and NOT saved on our site. Tumblers can be used for cold drinks and hot drinks up to 160*, fit any standard cup holder (but be sure to wrap with a paper towel if the cup holders are tight as to not damage the vinyl.) The tumblers are made of a hard acrylic plastic material, they are NOT unbreakable. Be careful not to drop or bang them as they may crack or the layers may seperate. The Designs are applied on the tumblers using a premium commercial quality outdoor graphic vinyl that is made to last a minimum of 6-9 years outside in the elements...the same stuff used on commercial vehicles and outdoor store signage. The tumblers are acrylic and may crack if washed in the dishwasher, hand washing is recommended. When hand washing, use a soft sponge or cloth and mild soap. Try to avoid soaps with added moisturizers as the oil can build up on the vinyl, as well as some "pure & clear" brands as they contain lactic acid and I've found they break down the adhesive. Do not let the tumblers soak in water for any amount of time. Dry them immediately. If you properly take care of your tumblers, they will last for years, minus normal wear and tear. our facebook fan page, our Instagram account, our twitter account and our pinterest account. If ANY person or business uses our photos on their social media, marketplace or wesbite as an example of things that they can make, they WILL be prosecuted. Unauthorized use of ANY of our images will be prosecuted.